Apartments in Ahrn valley: Here you feel at home! Family Niederkofler welcomes you in your comfortable accommodation in the Ahrn valley. In our apartments in St. Johann you can feel at home, relax and enjoy the sunshine of South Tyrol. Here five modern and cozy furnished, newly built apartments wait for you. Our apartments in South Tyrol offer all the amenities you expect from a quality hotel in Ahrn valley. Looking for an accommodation in Ahrn valley? With us you will find it! 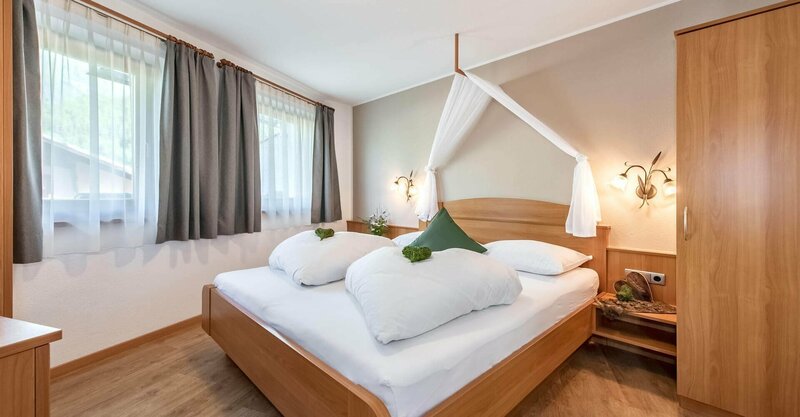 With 43 to 65m² our five apartments in South Tyrol offer enough space for four to six people, so couples and larger families can be comfortably accommodated. All holiday homes in St. Johann consist of separate bedrooms, a living room with kitchen and a bathroom. The barrier-free ground floor apartments have direct access to our beautiful garden, and apartments on the first and second floor have a spacious balcony where you can enjoy the view and the sun. In the bedrooms of our accommodations in Ahrn valley you can rest in our cuddly beds. Each bedroom has a safe for your valuables ready for you. In the living room there is a sofa bed, and if needed, we will provide you an extra bed or cot. The bathrooms are equipped with shower, toilet, bidet and washbasin. In the kitchen of your holiday apartment in St. Johann, you can easily take care and make yourselves comfortable in the corner seat. Besides an electric stove, a refrigerator and coffee machine you will find of course all the necessary kitchen utensils. Upon request we provide a kettle and a toaster, and if you want, you can use our bread delivery service for breakfast. To offer more amenities during your stay, the apartments are well equipped with satellite TV in the living room, wireless internet and sitting and lying sets on the balconies. In the storage room you can leave your bikes, skis, shoes and much more. Enjoy our lawn, our spa and games room.